Tell us your preferred option for development in Earls Barton! 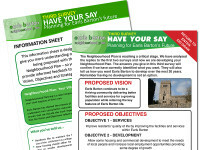 The Earls Barton Neighbourhood Plan Group have analysed the replies in the first two surveys and now we are developing your Neighbourhood Plan. Help us ensure we’ve understood you correctly by completing our third survey. Neighbourhood Planning FAQ What is Neighbourhood Planning all about? This website is run for and funded by Earls Barton Parish Council. Earls Barton is a village within the boundary of the Borough of Wellingborough in the Parliamentary Constituency of Daventry, Northamptonshire.